Just want the basics? Download an overview of Everything DiSC®. DiSC® is a registered trademark of John Wiley & Sons, Inc. All rights reserved. Everything DiSC® helps people build more effective working relationships based on an understanding of different behavioral styles. Everything DiSC® is not a test, it's a personality assessment. This research-validated model helps you understand yourself and others, saving you time, energy, and money. What is the basis of Everything DiSC®? What do Everything DiSC® participants learn? Who benefits from Everything DiSC®? How is Everything DiSC® implemented? What else can Everything DiSC® do for my organization? Everything DiSC® is a suite of customized assessments and workshops designed to help teams work better together, improve employee and workplace communication, reduce conflict, and avoid misunderstandings. Everything DiSC® workshops use the custom, research-validated DiSC® behavioral assessment to help you understand yourself and others. The assessment asks users to rate the degree to which they agree with a series of statements about themselves and their behavior, then presents those results on a circular map to show where leaders’ personal preferences show up in relation to the other styles. While every person is a blend of all four, certain preferences and tendencies can be ascribed more strongly to one or two styles. Each style has benefits and value, there is no perfect DiSC® style, nor are there good or bad behaviors. Everything DiSC® is a way to understand yourself better—the first step to becoming more effective when working with others—and learn about those around you to understand their priorities and how they might differ from your own. What does Everything DiSC® do? The Everything DiSC® assessment is designed to bring a common language and understanding to coworkers, teams, managers, and employees. 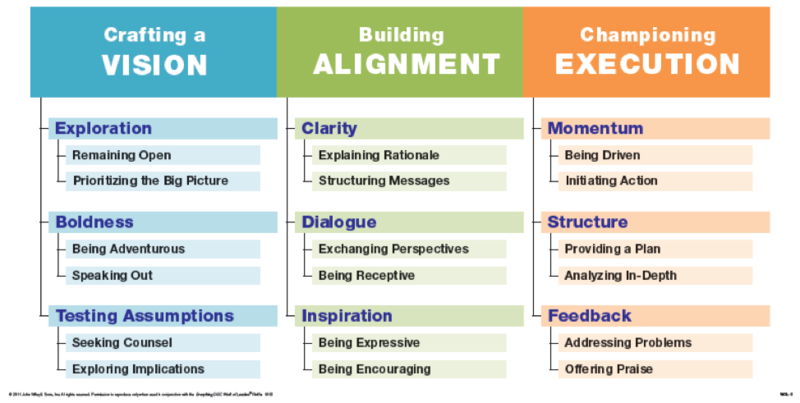 Not only does it increase self-awareness, it highlights differences and potential for misunderstandings while providing employees with a way to communicate about those differences to increase effectiveness and productive relationships at work. Everything DiSC® Workplace is an assessment and workshop that can be used by everyone in the organization, regardless of title or role, to identify and explore the priorities that drive individuals. Everything DiSC® Management is an assessment and workshop that helps managers identify and explore the priorities that shape their management style to better understand how to work with, manage, and develop their employees. Everything DiSC® Productive Conflict is an assessment and workshop that helps participants identify and improve self-awareness of conflict behaviors. It shows how individuals and DiSC styles behave during conflict and is designed to help participants learn how to reframe automatic thoughts in order to choose productive conflict behaviors and increase productive relationships at work. Everything DiSC® Sales is an assessment and workshop that helps both inside and outside salespeople better understand themselves, their customers, and their workplace relationships to connect better and close more sales. Everything DiSC® Work of Leaders focuses on tangible steps to lead a group or organization toward desired outcomes by helping leaders increase effectiveness in creating a vision, gaining team alignment, and executing to achieve the vision. Everything DiSC 363® for Leaders is an assessment that shows leaders how others see them, plus provides them with next steps and three things that the leader can focus on right after taking the assessment. The standard Everything DiSC® programs are half-day or one-day workshops. Each participant takes the assessment online, followed by an in-company workshop and optional group coaching and reinforcement options. Everything DiSC® offers Comparison Reports, Group Culture Reports, supplements for facilitators, and facilitator reports to better understand the coworkers and teams that participants work with. Everything DiSC® Comparison Report: This follow-up comparison report shows the similarities and differences between two people on six behavioral continua. Everything DiSC® Group Culture Report: The group culture report can be used to determine the DiSC® culture of a group or team, explore its advantages and disadvantages, discuss its effect on group members, and examine its influence on decision-making and risk-taking. Everything DiSC® Supplement for Facilitators: This tool provides more detailed data about the Everything DiSC® assessment and helps facilitate a richer discussion about a respondent’s DiSC® style, including unexpected items. Everything DiSC® Facilitator Report: The facilitator report provides a composite of your group’s DiSC® styles, with the name and style of each participant. It provides information on how the DiSC® styles collectively can impact your culture. MyEverythingDiSC.com: A portal that provides participants with reinforcement, reference materials, and blended learning program options. FlashPoint can also provide you with an online account to administer your own Everything DiSC® assessments by issuing access codes, monitoring report completion, customizing reports with your brand, and printing reports. This option allows you to select the assessments you want to administer, adapt them to meet your needs, and select follow-up tools to enhance interpretation and facilitation. FlashPoint is an Authorized Partner of Everything DiSC®. Which leadership style best fits your team? Understanding the styles and priorities of others creates stronger working relationships, better leaders, and more effective teams. How does Everything DiSC improve leaders and teams? Effective communication is good for everyone; all employees benefit from improved workplace communication, increased productivity, and operational effectiveness. Everything DiSC Facilitator Training supports the Human Resources and Organizational Development function. It’s always beneficial to have another tool in our tool belt when we are trying to create workplaces that are productive. Practical ways to use Everything DiSC with teams. Use DiSC to improve employee training, integrating new team members, and improving team relationships. DiSC communication exercises for reinforcement. Tips to keep DiSC top-of-mind for employees as they communicate with others. How effective is Everything DiSC®? Understanding how people work together best is a must for onboarding employees and improving employee engagement. How do you know if Everything DiSC® is right for your team? Here's a quick guide to the who, what, and how of Everything DiSC®. Organizational goals supported by Everything DiSC®. Imagine if your organization’s leaders knew how best to approach their team members and colleagues according to each person's unique work style. Everything DiSC® improves employee engagement on remote teams. Knowing the preferred method of communication with other coworkers leads to better results. These research-validated follow-up reports can be created for any two participants to illustrate their similarities and differences on six behavioral continua. The reports are great for onboarding, new work groups, conflict management, and more! The group culture report helps you determine your group’s DiSC culture, explore its advantages and disadvantages, discuss its effect on group members, and examine its influence on decision making and risk taking. This tool provides more detailed data about the Everything DiSC® assessment and helps facilitate a richer discussion about a respondent’s DiSC style, including unexpected items. The facilitator report provides a composite of your group's DiSC styles, with the name and style of each participant. It provides information on how the DiSC styles collectively can impact your culture. FlashPoint offers a variety of Everything DiSC® assessments and training to support your needs. Ready to explore the benefits of Everything DiSC®? Contact us. FlashPoint can help set up an online account, so you can administer your own Everything DiSC® assessments. You’ll be able to issue access codes, monitor report completion, customize reports with your company brand, and print reports from anywhere at any time. You can choose which assessments you want to administer, adapt them to meet your needs, and select follow-up tools to enhance interpretation and facilitation. Your online account offers an easy way to create, view, send, and print the assessments you need to build better teams! Want to become an expert at interpreting Everything DiSC® profiles and utilizing the wide array of Everything DiSC® products? FlashPoint can provide you and others with training. Ultimately, we want to ensure that you learn the theory behind DiSC®, get hands-on experience with a variety of Everything DiSC® profiles, and fully understand how to interpret and incorporate them. We also offer facilitation kits featuring leader guides, PowerPoint presentations, videos, and handouts that you can use to train your team members on utilizing their Everything DiSC® assessments. FlashPoint is a Ruby award-winning Partner for Everything DiSC® and The Five Behaviors of a Cohesive Team™.